Students crossing Fountain Avenue during a newly-implemented pedestrian-only signal phase. Photos by Joe Linton/Streetsblog L.A. 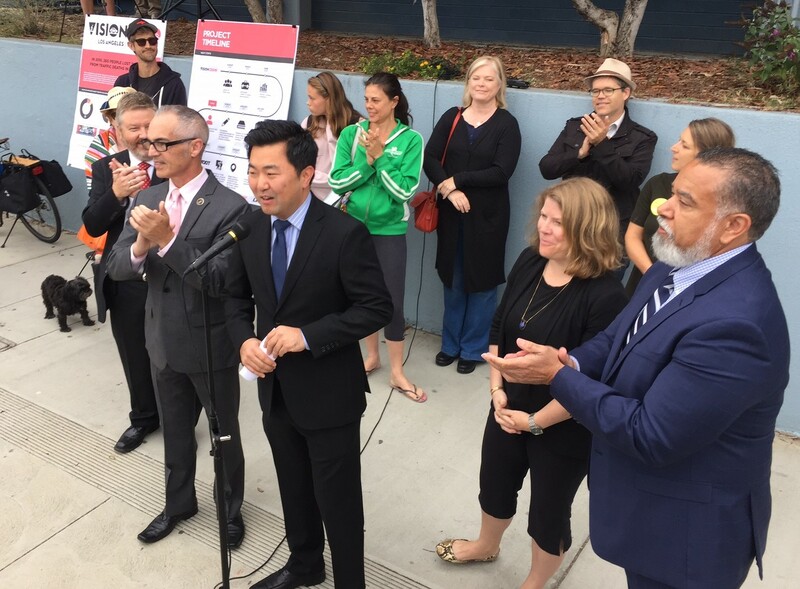 This morning, L.A. City Councilmembers David Ryu and Mitch O’Farrell joined Thomas Starr King Middle School and LADOT in celebrating the city’s first use of a scramble “all red” crosswalk to get students to school safely. (See correction below: LADOT clarified that technically this not a “scramble” but an “all red” phase) Both Ryu and O’Farrell expressed that keeping students safe was a top priority. Thomas Starr King Middle School is located on Fountain Avenue, just east of Sunset Boulevard, on the border between the neighborhoods of Los Feliz and Silver Lake. The neighborhood is sometimes called Franklin Hills. With many students crossing a busy Fountain Avenue to get to class, the school has an unfortunately long history of difficulty in keeping students safe. In 2008, ABC7 reported that three students were struck by cars within a two-week period. These dangerous crashes prompted the city to seek and obtain state Safe Routes to School funding, which went to widening sidewalks, speed feedback signs, underpass lighting, and a program to teach students to walk safely. Nonetheless, traffic dangers persisted. This stretch of Fountain earned the dubious honor of being included in the city’s Vision Zero High Injury Network, the six percent of L.A. City streets where 65 percent of all deaths and severe injuries take place. In adopting its Vision Zero policy, L.A. is committed to reducing traffic fatalities to zero by 2025. As of this morning, the T-intersection of Fountain Avenue and Myra Avenue features a separate pedestrian “all red” phase. The all red phase is somewhat similar to pedestrian “scramble” intersections in Los Angeles, including Hollywood/Highland. At Fountain/Myra there are no new pavement markings but there are new signs restricting right turns on red. The all red phase operates only at school travel hours: 7 to 8:30 a.m. and 1:30 to 3:30 p.m. At those times, pedestrians get their own 30-second crossing phase, while all automobile traffic waits. 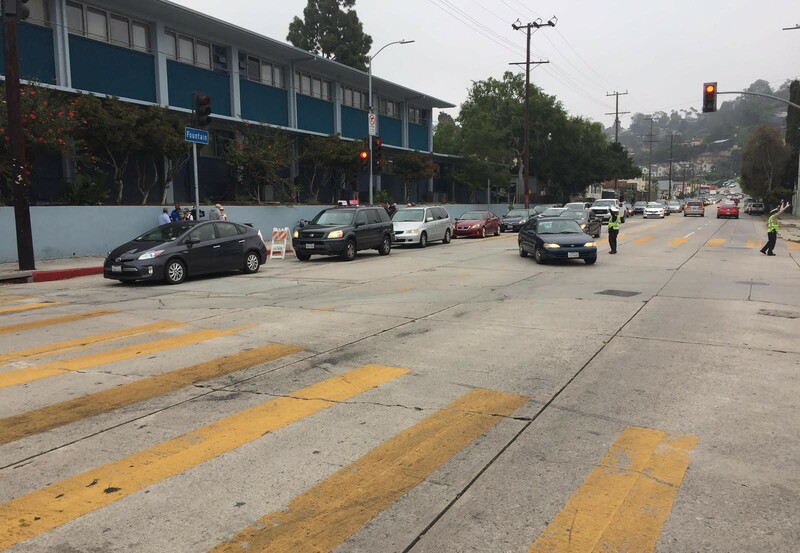 This morning, while officials celebrated the new safety feature and LADOT traffic control officers worked the Fountain/Myra intersection, eastbound cars backed up into the five-way intersection at Sunset Boulevard. The back-up peaked just before 8 a.m. and lasted only a couple of signal phases. The worst back-up coincided with a high volume of drivers dropping students off at Starr King. Hopefully the new pedestrian scramble phase can help turn the tide on the vicious cycle where high traffic volumes make streets unsafe, thereby triggering more parents to drive, resulting in higher traffic volumes, less safety, and more and more driving. Studies show that, in the U.S., 10-14 percent of morning peak hour traffic congestion consists of parents driving kids to school. As LADOT makes streets safer, perhaps more parents will support their kids walking or bicycling to school. A brief car traffic back-up (which may lessen over time as drivers become accustomed to the new arrangement) seems like a small price to pay for major improvements for getting students to school safely. 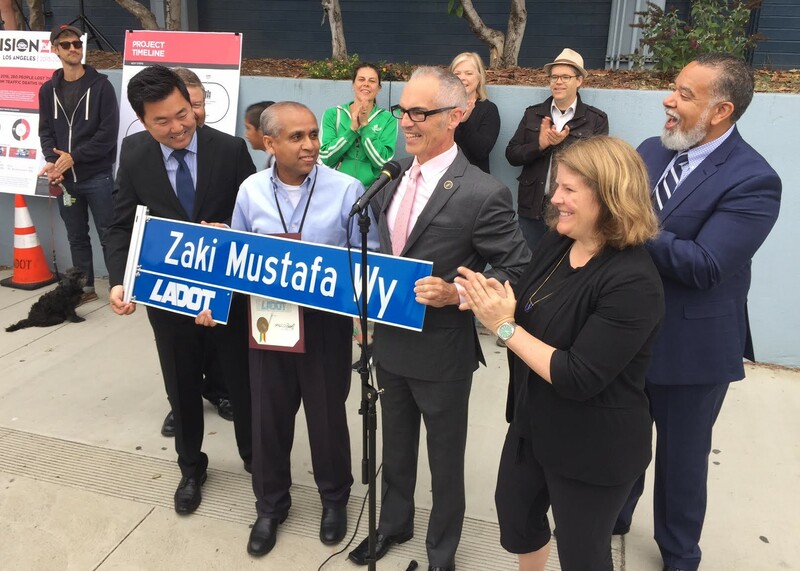 This morning’s celebration also honored the work of maverick LADOT transportation engineer Zaki Mustafa. Nominated for a 2016 SBLA Streetsie award, Mustafa has been the LADOT expertise behind numerous great projects, including bike lanes, scramble crosswalks, high-visibility crosswalks, bus-only lanes, parklets, plazas, and more. Mustafa is retiring later this week. Councilmembers Ryu and O’Farrell presented Mustafa with a commendation certificate and a “Zaki Mustafa Wy” street sign. Even though he is retiring this week, Mustafa was excited to explain to SBLA his newest innovative idea: a pedestrian-activated scramble intersection that would use camera sensors to detect pedestrian volumes. Thanks Zaki Mustafa for all your important work. 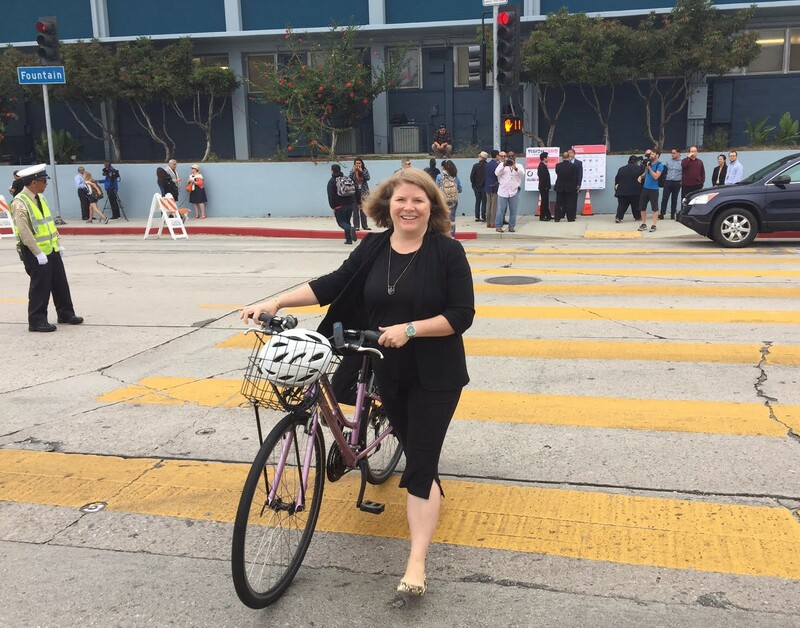 LADOT General Manager Seleta Reynolds arrived by bicycle. It’s rich to see David Ryu saying that student safety is a top priority of his when he actively worked against Mike Bonin’s efforts to fund Vision Zero. I mean, not that anyone will call him out on it, right? I didn’t know scrambles could be programmed to operate at specific times. A lot of intersections in LA could use that kind of programming. Like a 7am to 7pm sort of thing. It can vary with the seasons or if there’s a time when heavy pedestrian traffic is expected. 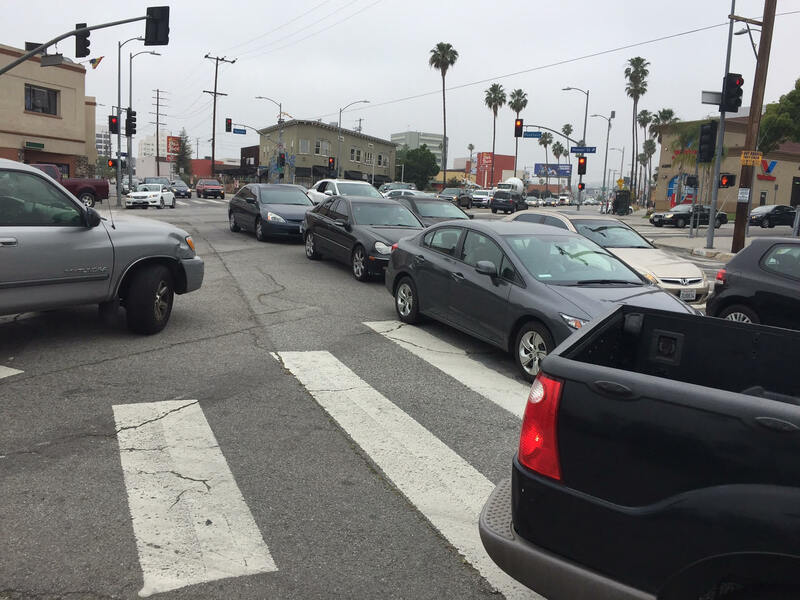 Did LADOT have to apply for a waiver to get this approved? I attended a Caltrans class last year and was told that it wasn’t possible to have part-time scramble phases. 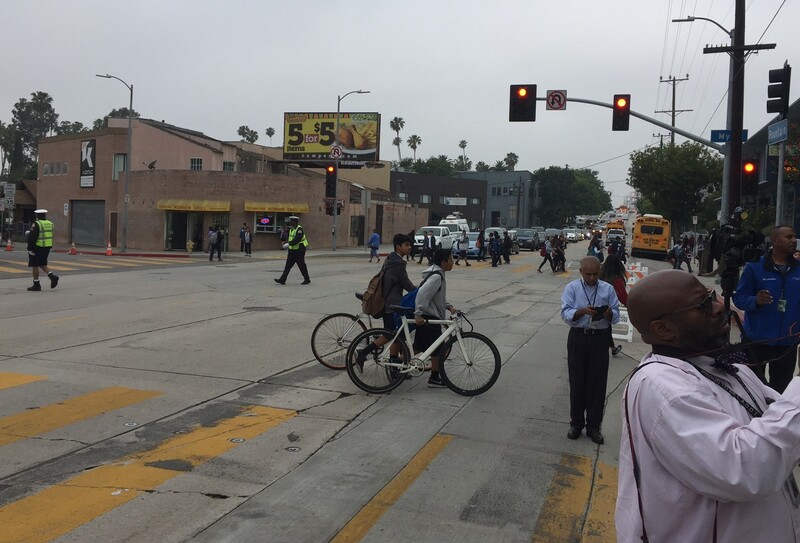 I just added a correction – though I observed scramble behavior (see the cyclists on foot in the photo above – they’re not in a crosswalk), LADOT is saying that this isn’t a scramble – but is merely an “all red phase.” Can you share any reason Caltrans gave for not having part-time scrambles. Does the distinction mean that you can’t cross diagonally during the all-red phase? The teacher really didn’t have a good reason given as to why it couldn’t just be active at specific times beyond it being not allowed. That doesn’t make sense because there are time-specific restrictions all over the place, but that’s what we were told. Good to see LA ignoring that nonsense. Now, they probably need to do some bulbouts to prevent people from inching up for the right turns. Please do something about the bike tire sized crevice on Fountain going downhill toward the school! Yeah this is interesting. Was just in Oakland’s Chinatown last weekend at about midnight and it still had the all red, walkers only phase, though there were no walkers out on the street. This could be a good compromise to use during rush hour or more broadly as you suggested. Because it’s a cement street, the crack runs all the way from Sunset on down to the intersection. It’s not a 311 issue, unfortunately. The same is true on the westbound side. And then there are all these crazy broken sections that, along with the cracks, make it really hazardous if you’re trying to make a left turn onto Myra… having to move across two lanes of very fast moving traffic while trying not to hit something that would send you over your handlebars or get your wheel caught in a crack is incredibly nervewracking. They need to redo the whole street, but getting cement streets, according to planning folks I spoke with a while back about this, is tough for a number of reasons, one of which is street historians who want to preserve cement streets because they are part of LA’s history. I don’t know how serious that opposition is, but it would be really nice to see it redone so cyclists don’t feel they’re going to die every time they roll through it. FWIW, I think this is a T-shaped intersection, which somewhat minimizes the benefits of crossing diagonally in the first place. And he killed the 6th Street Road Diet the neighborhood was begging for.